Gentle readers, have we been up to something of late! Some of you may know of my affiliation with House of Leaves Publishing as technical editor, working primarily with resumes, application form completion, personal statement writing, and cover letter writing, to name a few. 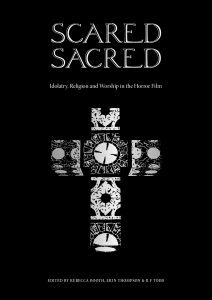 In addition to technical services, House of Leaves has been hard at work on our in-house publication of semi-academic writing, Scared Sacred: Idolatry, Religion and Worship in the Horror Film, edited by myself, Rebecca Booth and RF Todd. Scared Sacred is a collection of writings exploring the cultural history of religion in horror cinema, with entries from film critics, historians, and writers. For a complete list of the book’s contents, please visit House of Leaves Publishing. The book, due for release in early 2019, will enter into the crowdfunding phase in September 2018. We’ve got some pretty nifty rewards on the horizon, including Professor Douglas E. Cowan’s fascinating book, Sacred Terror: Religion and Horror on the Silver Screen (Baylor University Press, 2016, and tickets to both Grimmfest and London Horror Festival. You can register interest and receive updates by visiting House of Leaves’ website and signing up for their mailing list. As both an editor and one of the contributing authors, we are pleased to exclusively share with you a sneak peek of one of the chapters in this collection! The chapter, written by yours truly and titled “The Last Temptation: Demonic Warfare and Supernatural Sacrifice in The Amityville Horror (1979) and When the Lights Went Out (2012),” focuses on a pattern of supernatural disturbance, possession and affirmation of faith in the films, as well as the Biblical notion of temptation and sacrifice, as demonstrated in the tale of Abraham in the Book of Genesis. When the Lights Went Out may not be as well-known as The Amityville Horror — however, this film is a fascinating gem with great relevance to the subject matter. You can find a trailer for When the Lights Went Out here. This is but a taste of the chapter, and we hope you enjoy it. The supernatural phenomena associated with both The Amityville Horror and When the Lights Went Out has been the subject of scientific grappling for some time, as both experience an alleged poltergeist. A notoriously difficult-to-define phenomenon, a poltergeist is most often described as “an unusual form of energy produced most often by a young person,” though “ghosts or demon possession” may function as the root cause (Clarkson, 2011, p. 11). While documented poltergeist attacks have a relatively short duration of approximately one week to three months, instances of poltergeist activity may stem from extreme stress, and include but are not limited to unexplained knocking, electrical outages, pockets of cold temperatures, and unfamiliar voices (Clarkson, 2011, p. 11). Typically, the perception of the poltergeist is of a playful trickster—the entity or energy doesn’t seek to actively harm an individual, but merely create loud attention in an almost childlike fashion. As the manifestation of energy is thought to stem from the presence of a distressed youngster, this perception of a loud but harmless entity persists in dramatic interpretations of alleged cases within popular culture. Commonly, poltergeist manifestations are attributed to a hoax instance or the possibility of psychokinetic abilities, also known as PK; PK is thought to be a component of zero-point energy, a theory that states gravity and inertia may be manipulated to propel objects (Clarkson, 2011, pp. 79-81). An individual capable of causing the poltergeist phenomenon is known as an agent, and is typically “an adolescent of above-average intelligence with a low tolerance for frustration, repressing feelings of aggression and hostility… In many, if not most cases there seems to be a buildup of stress, fear, frustration, or anger in a household and/or in the poltergeist agent” (Clarkson, 2011, pp. 82-83). As such, author Michael Clarkson refers to PK as a type of fight-or-flight response called the “emergency fear system,” which displays physical manifestations such as pupil dilation, increased air supply, and heightened concentration—all of which could pave the way for psychokinetic response (2001, pp. 86-87). Clarkson offers that poltergeist phenomena may be relieved via the passage of time, psychotherapy, or the addressing of any stressors that could aggravate the potential agent of such disturbance. Stressors exist in the form of a new household and the pressure to succeed financially in both films. The Amityville Horror’s Lutz family consists of a pair of newlyweds seeking to succeed financially—George and Kathy purchase a home that would have been otherwise unavailable to them to provide a fresh start with their new blended family. Both situations—the uprooting of one familiar environment to another and the integration of young children into a new marriage—are more than enough cause for a substantial amount of stress. In the case of the Maynard family in When the Lights Went Out, Jenny is determined to remain in the nice home that council housing has assisted her in obtaining—to her, it’s a beautiful home she is lucky to have, and she does not wish to surrender it without a fight. Furthermore, Jenny and Len have one of the most formidable manifestations of stress known to humankind: a sullen teenager. Sally expresses through body language and verbal communication her displeasure at the move, and clashes with her mother in a fashion many today would consider borderline abusive, ranging from name-calling to slapping and hurtful accusations. Both films have ample sources of familial conflict: the changing of homes and the presence of children who have the potential to act out against the latest forms of change over which they have no control. The individuals possessing the most potential to physically manifest a psychic temper tantrum are those responding to a situation that feels powerless in the midst of the high-stress scenarios listed above. Clarkson, M. (2001). The poltergeist phenomenon: An in-depth investigation into floating beds, smashing glass, and other unexplained disturbances. Pompton Plains, New Jersey: The Career Press, Inc.